Disney has a tradition of re-releasing its movies every seven years. 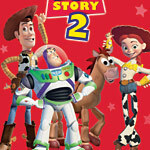 That tradition seems intact, as proved by the new “Woody’s Roundup Edition” of Toy Story 2, recently released on DVD. The toys are back in town. And they’re still very good! The toys are living their lives in peace when those two dreaded words appear on the lawn: “Yard Sale.” Wheezy the asthmatic squeeze toy is hauled to the curb in a box. Woody sets out, riding the family dog, to rescue the toy when a collector shows up. The collector spots Woody right away and snatches him up to round out his collection. We learn that Woody was the centerpiece of a fifties TV show called Woody’s Round-Up. His co-stars Jessie, the Prospector, and his trusty steed Bullseye are already in Al’s collection. The Prospector is even still in his box. Meanwhile, the toys from Andy’s room set out on a rescue mission to save Woody from a fate worse than death — not being played with by a child. Once again, Pixar’s genius comes not so much from the technology — which is outstanding — but from good characters and good storytelling. It doesn’t hurt to have a few laugh-out-loud jokes, either. The two-disc DVD is packed with special features. Many are standard fare, but most are cool enough to make Toy Story 2 worth the purchase price. First up is the audio commentary. Director John Lasseter anchors the commentary with his amiable, informative style. Sitting mic-side with him are co-directors Lee Unkrich and Ash Brannon, and co-writer Andrew Stanton. While you watch the audio commentary, subtitles appear on-screen to tell you which of the four is speaking — a nifty use of DVD technology that I hope catches on. The tone of the commentary is informative. There are definitely dry spells where the filmmakers just say “I love this part,” but more often than not, Lasseter and his pals have something interesting to say about the production. For example, Joan Cusack, who provided the voice for Jessie, really pushed the filmmakers to make her a strong female character. The filmmakers credit her with changing one scene from Jessie being rescued by Woody, to her rescuing Woody. The worst feature is a series of contrived interviews where actors are asked who their favorite character is. Common wisdom has it that animated features get better and better looking each year. And yet, looking back at Toy Story 2, which is going on 7 years old, the quality of the production (and of course, the presentation, which is 100% digital) is outstanding. On the audio side, the package boasts an “all-new Dolby 5.1 Surround” track, and there is a DTS track for those with the latest in home audio.